That’s the nice thing about a blog. It’s always waiting here for me to tell a story or two. My grandpa Dewey always said, “Come again, sometime.” We thought it was pretty funny, because often he said it a) when you were no where ready to leave, or b) when he was visiting at my mom and dad’s house. It was always worth a chuckle. Now that phrase has become a staple of our lives. My dad always says it when we part. Just for the fun of it. And whether consciously or not, my mind and heart focus on my handsome (and unique) grandpa Dewey. This weekend, Richard was cleaning out our front coat closet. 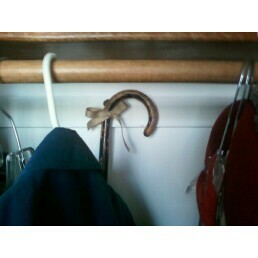 I saw he had moved my grandpa’s beat up old cane that I have kept, since his death, on the rail in the closet. First at our condo, then our old house and, for the past five years, here. I reminded Richard that I like to see it. He told me it was cumbersome with the limited space in the small closet. 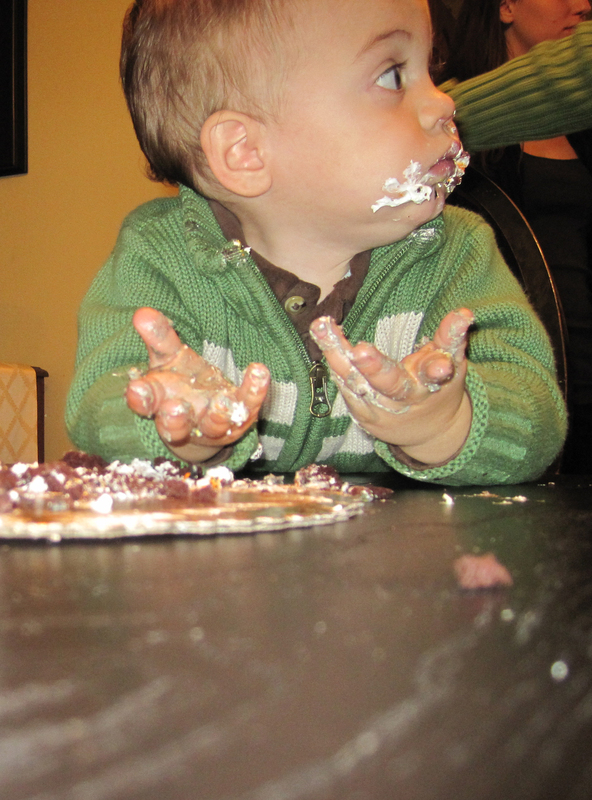 We left it at that as I was distracted by some other activity. This morning, when I went to get my coat, I saw this. It’s moments like this that remind me how blessed I am that my husband knows my heart. Like a DVR or cable system, it would be nice if I could digitally save myself to be called on later or available simultaneously at two rooms. For a reasonable fee (of course). Lillian: (hollering from behind her closed bedroom door) Do you want to know why I’m in here? Lillian: Because I’m angry at you. You’re not getting me my waffles! There is no glue for grapes. And if there was, I might have used it for myself, because I was coming unglued. Truth is, I realize she doesn’t do that to get to me. She does it because she really did want to see the pretty insides. And she really did want to see the grapes whole. But she couldn’t decide which one she wanted more. The life lesson: Think before you cut your grapes. Or your baby brother will get them, and you’ll get nothing. … it hits me that people are a little bit crazy. Today, when pulling into the drive-thru at a fast food joint, someone blindly backing out of a parking spot, stopped abruptly. Turned to me, and waved me on while mouthing the word a**hole. I was entirely perplexed. I wasn’t speeding, driving erratically, or anything worthy of a comment, let alone an expletive. I stopped. Cocked my head and stared at the driver for just a few seconds before proceeding. She was just a young woman. I think she must have realized I was baffled by her inaudible outburst. My windows were closed, as were hers. She just sat there looking back. Her own voice ringing in her ears. I saw her face wash with embarrassment. Which it should have. Then she quickly put her car in gear and zoomed out of the lot. Not to be old-fashioned … but where has courteousness gone? Is it that parents don’t teach their children? Are we in such a hurry to get to the next place that we’re willing to speed passed anyone who slows down, even for a second. Or shout profanities at those who can’t read our minds? Last week I watched a teenager picking up her brother at Henry’s school completely disregard the rules of pick up. Back up, take cuts in the line up, and zoom around other cars to get out while completely ignoring the halting hands of staff trying to direct the flow for the safety of the children. My kids gasped in horror. Who would do that? They wondered aloud. What’s wrong with her? Okay, so my kids get it. They get the rules. They know about courteousness, traffic flow and societal order so that there can be freedom within that order (how Montessori-ish). But what will they do when they encounter the overwhelming flagrant disregard for the same rules by which they abide? I don’t have anything clever to say on this one. I can’t really discount it, because I see it everywhere. I guess, I’ll keep doing my part and hope that enough parents are doing theirs. I’ll also continue to have faith that this is all part of God’s great plan. That’s how long Richard and I have been married. Twenty-one years in December. That’s also how far we got saying a family rosary tonight, before Lillian stormed out of the room, stomped her feet all the way to her room and slammed the door. Why? Because Cliff was whipping her with the rosary he was holding, and she wanted to lead every prayer. But if you have to tell her everything to say in bite-size phrases, it gets a little cumbersome for everyone else. Distraction is inevitable. We decided to quit while we were ahead. Twenty-one Hail Marys amid kicking, whipping and screaming has to count for something.